Qatar Airways is proud to celebrate the Thai and Sri Lankan New Years on select flights and in the Al Safwa First Class and Al Mourjan Business lounges by offering special menus delivering the flavors of both countries in the sky and on the ground. Thai New Year will be celebrated on 13 to 14 April on select inbound flights from Bangkok, Krabi and Phuket in both premium and economy cabins. The menus for Thailand flights will contain a specially selected main course and one dessert both prepared by Qatar Airways’ top chefs. The menu will feature traditional Thai dishes such as grilled prawns marinated in garlic and coriander with tom yam fried rice, stir-fried vegetables and tom yam sauce, as well as mango with sticky rice and pandan coconut sauce. 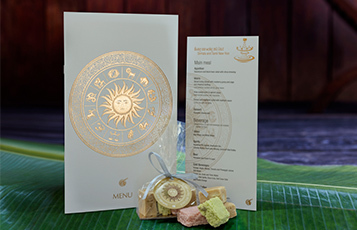 Passengers will also be presented with a traditional Thai sweet in a decorative box to complete their meal. In addition to the in-flight menu, Al Safwa First Class lounge will also offer a great selection of dishes in celebration of the Thai New Year on 14 to 15 April. The lounge menu will feature some of Thailand’s famous dishes such as tom yum soup, som tum, beef skewers, vermicelli prawns, satay gai and more. Dessert options will include coconut and jaggery pancake with banana smoothie and mango nigiri with pandan-flavoured coconut cream. The airline’s Al Mourjan Business Class lounge will also offer a wide variety of dishes, such as tom yum, pad Thai, beef stir fry and basil fried rice. The Sri Lankan New Year will be celebrated on 14 April on board Colombo inbound and outbound flights in business and economy cabins as well as in Al Safwa and Al Mourjan lounges. The Sri Lankan in-flight menus will feature dishes such as fish ambulthiyal with pol roti, kiribath, spicy potato, lunu miris and sambol for breakfast services, and Sri Lankan devilled chicken with vegetable fried rice, dhal curry, spicy potatoes with bibikkan dessert, served for lunch/dinner. Passengers will also be presented with traditional Sri Lankan sweets to complete their meal. On 13 April, the lounges will offer a variety of dishes such as mulligatawny soup, fish cutlets, cashew maluwa, and a selection of Sri Lankan sweets. All dishes are freshly prepared every day, giving passengers a taste of their favorite destinations. eTN readers with important news releases can go to www.buzz.travel to post them.